I write this in November. The month of ‘rusting weather’ as it is known in our house. Cold days followed by warm moist days, weather that leaves cold printing surfaces wet with condensation in our too-well ventilated workshop. (I must break off to empty the dehumidifier.) The hand-made papers don’t mind, but some of the machine-mades like to cockle and have no memory, staying that way even when they dry out. The Colours of Rome is almost ready to go to press – ironic that we should be printing a text about all those warm Mediterranean colours when the road outside is awash with run-off from the local fields and all is grey. Also brimming with colour, Stockholm Reflections is a new title that we take the opportunity to announce now, and one that I’m sure will appeal to anyone who loves big bright books! Read on . . .
Years ago, I bought a copy of The Britain of Brian Cook, a survey of the work of the artist who, in particular, designed the covers for the Batsford series of books on the British landscape. Cook worked with flat colours from a distinctive palette. I even considered collecting The British Heritage Series but, sensibly probably, decided against the idea. However, when The Whittington Press published its Portmeirion I had to have a copy for the wonderful illustrations by Leslie Gerry. 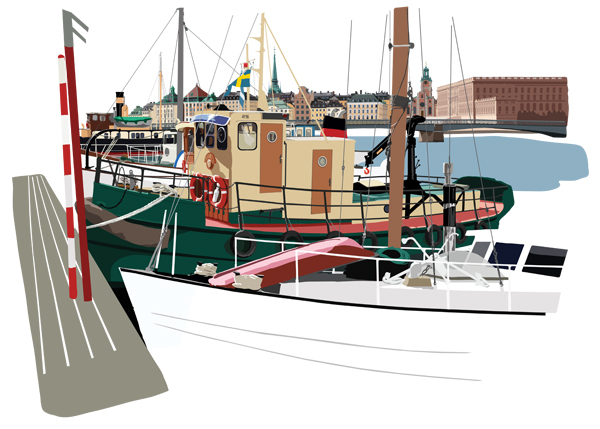 Leslie works in a similar way, now of course using digital tools, and he is preparing a set of ten large-scale and very striking illustrations of Stockholm, in particular its evocative waterfront. Many years ago (many, many years ago) Angela and I lived in Stockholm, right in the Old Town (Gamla Stan), so the island on which it stands, the waterfronts around it and on neighbouring islands, and the bustle of boats and ships were all five minutes' walk from our front door and we have fond memories of it all, both in the bright long summer days and the short winter days when the ice-breakers cleared the way for the Finland ferries and I could walk to work across Lake Mälaren. So when we met Leslie and heard about his project it became a must for The Old School Press. Leslie's images occupy a sheet 370mm tall by 560mm wide (that's about 14.5 inches by 22 inches) and will probably be compiled as a concertina-fold book. They are very much his response to the beauty of the place, to the colour and vibrancy imparted by the boats, the buildings, the sky and the water. (A much reduced version of one of the images is below.) His pleasure on first coming across the area echoes that of those who found their way to Stockholm in the eighteenth century and so to accompany the images we shall be printing extracts from travel books from as early as 1720. Putting letterpress text together with giclée digital images is becoming quite a habit here at The Old School Press; for us the two techniques are unrivalled for quality and I have no doubt that Caxton would have preferred giclée to woodcuts if he could have! So once again, expect clean letterpress from freshly-cast type combined with brilliantly rendered colour in a novel binding. This will not be a large edition. Do get in touch if you think this will be of interest. I hope to give further details including pricing in our next newsletter. I had hoped to get this title done in 2012 but, alas, it is not to be. However, everything is now in place and work can begin. It was some weeks ago that I collected the type from Stan Lane at Gloucester Typesetting, eleven galleys of 14pt Dante ready for making up into pages. And the paper has just this week arrived from Italy via London wholesalers John Purcell: a Magnani hand-made laid paper for the text and a heavier Magnani mould-made for the twenty large samples of paint that will accompany each copy to bring to life the colours that John has written about. I'm very much looking forward to getting started on the press-work - I have already put a nice new clean tympan sheet on the cylinder - always a good start! There will be 99 standard copies and 25 de luxe. The price per copy will be about £190 and £350 respectively. I shall be sending out a paper prospectus in the New Year with final details. You can read more about it at our website. The research for this book has been going on now for over four years, but the end is in sight. It has blossomed or mushroomed, depending on how you like to think of it. A small update on the make-up of the book is in order. To keep the size of each volume down to around 150 pages there will now be four volumes issued at intervals. Volume I, covering the resources of the Press, will now be divided into two parts. So, volume Ia will cover the premises, organisation, and paper, and volume Ib will cover the type. Volume II will concern itself with the process from author's copy to printed sheets for sale, and volume III will be about the Bible Press. I am just getting comments back from external readers for volumes Ia and Ib so I hope they can go into production soon in the New Year (but I'm not saying which New Year). We still have a few copies available of The Fell Revival and Harry Carter, Typographer. Stanley Morison & 'John Fell' is now sold out except for sets of sheets, but I do have an out-of-series copy that I can offer at a considerable discount to the original price - contact us if you are interested. Sets of sheets are available for all three and there is a special discount for anyone taking a set for all three: visit our website and click on the 'binders' button.